Enjoying: Like Jonze's other features, this is a complicated film. Two things to notice as you watch. One, the three appearances of dogs. Two, the constant references to eating, the mouth, teeth, food—in short, orality. "No one could have guessed," says Sendak, "that when I created the Wild Things they'd have such a hold over people," The book has gone through several incarnations. It became an animated short in 1973 with a later version in 1988. Then it became an opera in 1980 and 1984, and that was when the Wild Things acquired names. 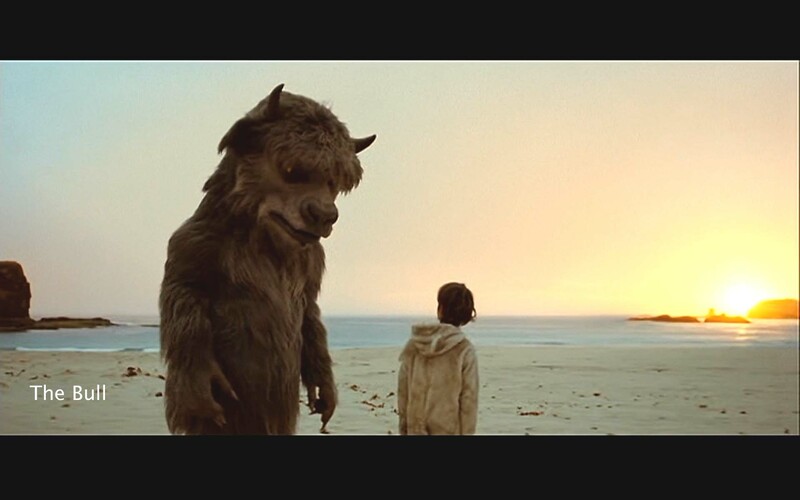 Then Dave Eggers, the scriptwriter for Spike Jonze's movie, turned his screenplay into a convoluted book, The Wild Things, some elements of which percolated into the film. And finally we have Jonze's film. Spike Jonze's movie doesn't just put Maurice Sendak's beloved classic on the screen. It couldn't, could it? Sendak's book consists of 338 words in ten sentences with eighteen picture panels. There is no way you can make so little material into a 100-minute film. "Lots have people have wanted to make the movie," Sendak says, "but I only wanted Spike to make it. He's crazy and whacked out and wild, but he's so gifted, creatively and dramatically. I think he's done a wonderful job bringing my book [to] the screen. I'm so pleased that I pursued him." And Sendak was sufficiently pleased with what Jonze was doing that he backed him against studio executives who wanted to Disnify this movie. When Sendak suggested that Spike Jonze make a movie of Wild Things, Jonze was, he says, "nervous about it because the book is so short." Anything he added "would just sound cheesy. But over the years, as I started thinking more about the book, I suddenly thought that the Wild Things could be wild emotions. Suddenly out of that everything tumbled and it felt like I could build from inside the book." In short, this is not a kids' movie. It is faithful to Sendak's book, but with a great deal added to develop the idea of the Wild Things as "emotions." The plot of the film is simple enough, and it does follow Sendak's book. 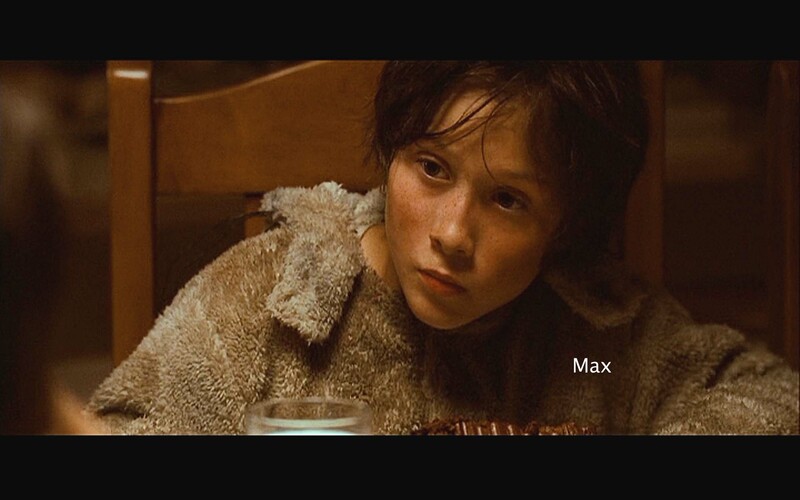 Max is beautifully played by Max Records, nine years old at the time filming began. He is, Jonze says, the "heart" of the movie. Max suffers a variety of frustrations, and eventually he has a tantrum and runs off into the street in his wolf-costume. He sails through a storm and big waves to an island where there are Wild Things. 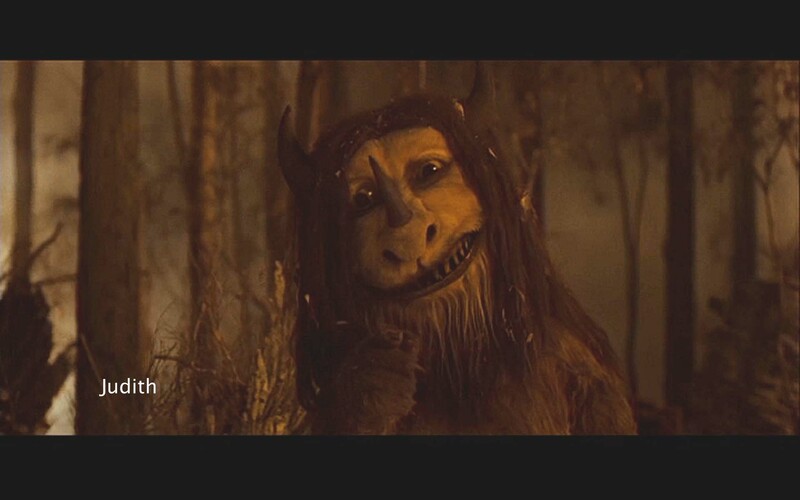 (Jonze's nine-foot costumes, created by Jim Henson of Muppets fame, closely follow Sendak's wonderful illustrations). The Wild Things crown Max king, but they become disillusioned with him when he cannot live up to his promise "to make everyone ok." Max sails away, lands, and runs home where his mother (Catherine Keener) hugs him and holds him and feeds him chocolate cake. In other words, Max retreats from the frustrations of his life into fantasy, and so do we all. As his mother says in the film, "I could use a story." The movie works with our human propensity for fantasizing. Like Spike Jonze's other features, this film goes into an individual's mind, Max's, and puts that mind's thoughts and feelings on the screen. It's a movie about childhood, Jonze says. Even more, I think, this is a film about the child in us. It's a film about human nature. Surely that is its delightfully paradoxical quality, that we understand our humanity and our emotions by seeing them in monsters. People come away from this movie with this question, Who or what are the "Wild Things"? 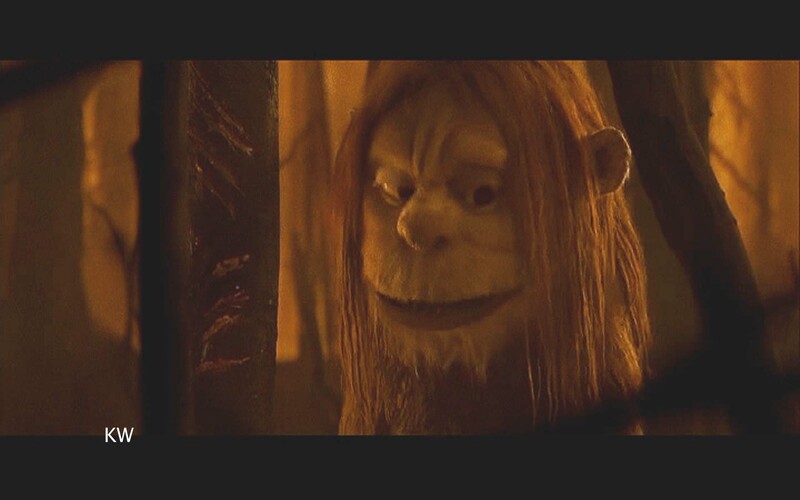 To me, they continue Jonze's interest in puppets and other imitations of the human as demonstrated by the puppetry in Being John Malkovich and the flowers and biology in Where the Wild Things Are. Jonze himself comments, "They are furry and cuddly but giants with teeth and nails, and they're dangerous . . . . Their heads are half the size of their body so they are baby-like in that way. And they're hairy." 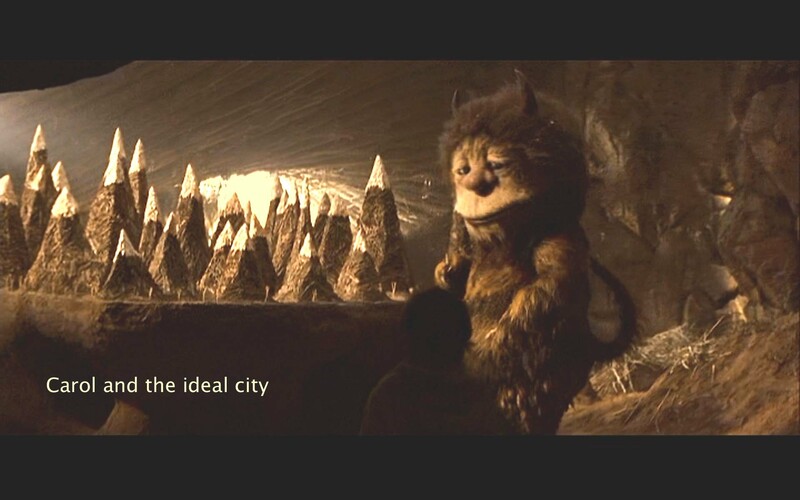 It doesn't take Freud to spot that, to some extent, [the Wild Things] each represent aspects of Max's personality at a time when he's starting to realize the universe does not revolve around him. Lead Thing Carol (James Gandolfini) is Max's creative passion, the unintentional fuel for his violent, pre-adolescent tantrums. As such, he's closest to Max, but during the film's darker turns, also the monster who presents the greatest physical hazard: the rage that threatens to consume him. KW [Lauren Ambrose], of course, is Max's love for his mother and sister, the people who, given his absent father, make his world, and who he fears will abandon him. Judith (Catherine O'Hara) is his spitefulness, Ira (Forest Whitaker) his calm side, Alexander (Paul Dano) his insecurity, Douglas (Chris Cooper) his reason, and the unnamed bull [Michael Berry Jr.] his sadness. This kind of reading raises a more basic question, though. Do we think the events on the island simply mirror events in the frame story, Max's igloo being destroyed, his grief and anger, or his "being out of control"? Or do we think the Wild Things open the movie up to larger issues? Characteristically, I go for the larger issues. As Jonze does. "I suddenly thought that the Wild Things could be wild emotions." I read the characters somewhat as Jones does, not so much, though, as emotions in the abstract, but as configurations of emotion as they play out in human character types. Carol. He is the idealist who has a notion of how things ought to be. He is a planner who has modeled an ideal community world. "It was going to be a place where only the things you wanted to have happen would happen." "I guess that's not gonna happen, though." Frustrated at the end at Max's abandoning equality and asserting special privileges for the king, he destroys that world and gives up his hope that the "king" will make all right. KW. She is a mothering person, so much so that she swallows Max to protect him from Carol's rage and "gives birth" to him again. When she leaves, she turns Carol from builder to destroyer of their "nests." And she does go away and come back, a source of rage (according to classic psychoanalytic thinking) for a child in the earliest (oral) stage of infancy. And she brings in other children, Bob and Terry. Another major source of childhood distress is sibling rivalry. Judith and Ira are a pair, in love apparently. Others describe Judith as a loser and a downer, an opinion with which she agrees. She represents a kind of depression. "But happiness isn't always the best way to be happy." 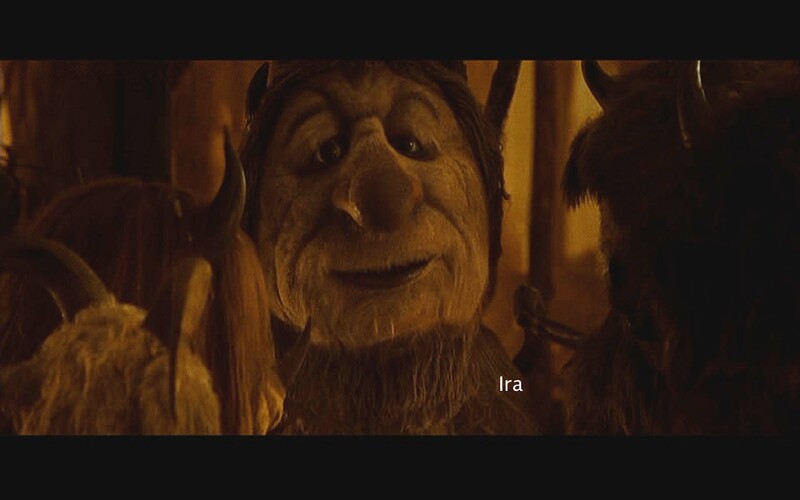 Ira seems fatherly, not in the big, powerful sense of a father, but affectionate and kindly—avuncular. He is more decorative than useful: "I put holes in trees." Okay. That's nice. 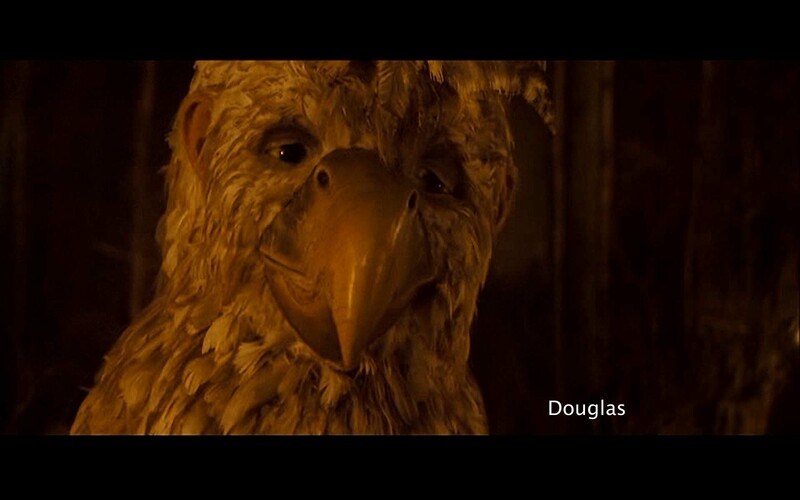 Douglas is the capable doer, a technician. He gets things done without any particular emotional coloring. Carol's furious efforts to make things right in Max's war end up by costing Douglas his right arm. Little Alexander, the smallest of the Wild Things, is a needy, dependent youngest sibling who needs people to pay attention to him. He is easily jealous. He worries constantly lest people are not looking out for him. Then there is The Bull who is, quite simply the loner. He stays by himself, not saying anything, not relating to the other Wild Things or to Max. At the end, he simply asks Max the minimum: to say good things about the Wild Things. To me, he represents the irreducible solitariness of being human. 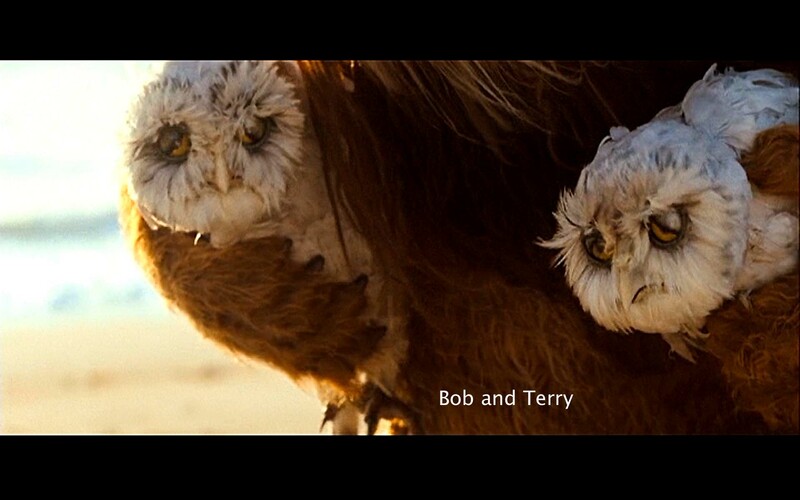 Finally, there are Bob and Terry, the two baby owls. KW says they are "different from everybody here." I read them as unemotional, abstract intelligences, mathematicians if you will, owls being associated with wisdom. They will only answer questions seven words long. They speak a language no one else understands. They have to be brought down to earth (by motherly KW) to relate to the other Wild Things. And Carol, the idealist, is jealous of them and rejects them. Their abstract thinking threatens his. As for Max himself, he makes fantastic claims of having been a king for twenty years, of having vanquished Vikings, of having "made everything right." The Wild Things believe him. At first his childish carryings-on satisfy: they have a wild rumpus. They all sleep together in a big warm, furry pile. Carol, like Max's father's inscription on his globe, tells him "You're the owner of this world. Everything you see is yours." The world, of course, is a fantasy world, where night and day, desert and forest, sunshine and snow, appear and disappear randomly. In short, I read the enigmatic Wild Things as recognizable psychological types, each representing a certain pattern of coping with Max's (or our own) impulses. They bridge the inner world and the outer world. To work together in a society, and the strange island with its strange creatures that constitutes a family or a society, they need a "king." That is, they need what psychoanalysts would call "ego" and what neuropsychologists would call "executive function." They need someone to lead and to govern their diverse characters. Max steps forward, claiming great powers from another land, from ancient times. 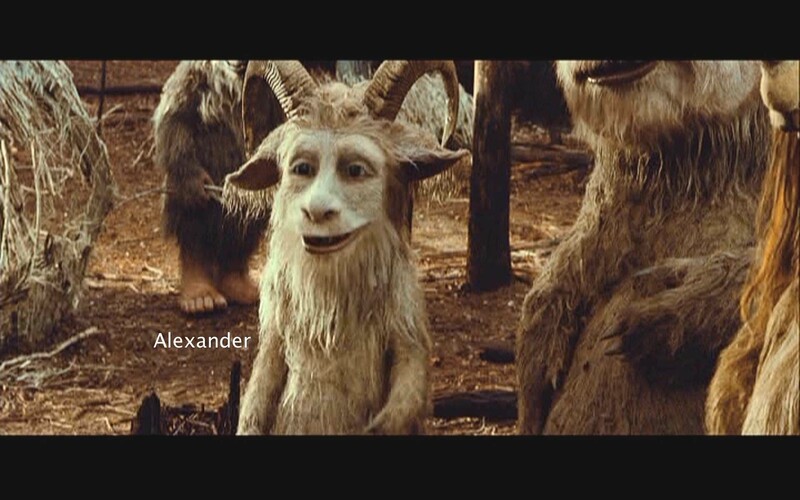 The Wild Things greeted Max's claim of powers with enthusiasm when they thought he could serve that function. "You were a king? And you made everything right?" "Will you keep out all the sadness?" But as the film goes on, he fails, to their great disappointment. "He's just a boy pretending to be a king." At the end, when pressed by Carol, he admits, "I'm Max." "That's not much, is it," says the disillusioned Carol. That's my reading of the Wild Things as types of psychological coping. When we read characters in movies, though, we do so in highly individual ways. Less subject to idiosyncrasy are more obvious and explicit elements, like here, the three appearances of dogs and the recurring references to eating. Again and again in Where the Wild Things Are the characters refer to eating. Max's mother prepares dinner in the frame story. 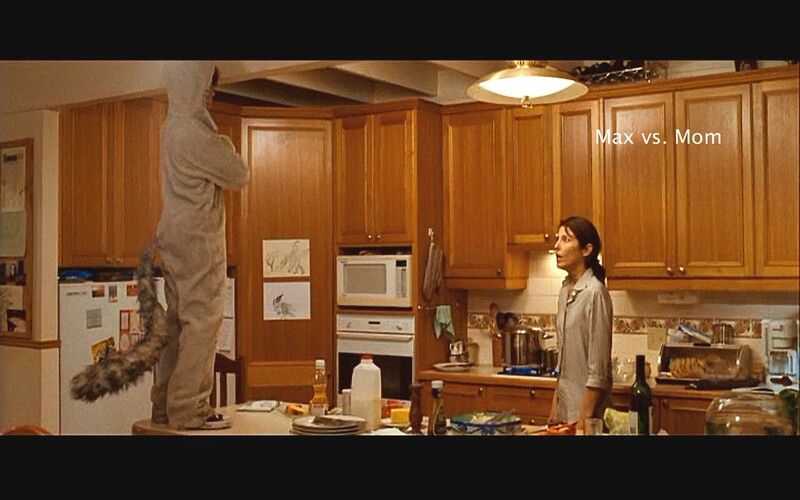 The Wild Things' first reaction to Max is to eat him. Carol compares disunity among the Wild Things to teeth falling out (and in Max's story a vampire loses his teeth). Carol's last resort, when frustrated, is to eat his toes. And there are those ominous bones. At the end the Wild Things tell Max, "You are the first king we haven't eaten." (Shades of The Golden Bough! Are these the slain and eaten kings of myth and ritual whose deaths ensure rebirth for crops and community? Another psychological pattern.) Orality, to a psychoanalyst, involves all the things associated with one's early relationship to a mother, especially the love a baby feels when she is close and the overwhelming rage her withdrawal causes. Dogs appear three times. In the opening shot (always important!) Max roughhouses with the family dog. In the finale, as Max is running home, he passes a dog who runs alongside, the two of them barking. (There is a funny feature on the DVD of Jonze's wacky efforts to get a dog to run and bark at the same time. It suggests how essential this brief element was for him.) On the island, when he and Carol are walking in the desert, a huge dog appears with a thud. Carol explains, "It's that dog. Don't feed it. It'll just follow you around." Like the oral references, I think dogs represent a basic animal level, the crude mammalian core of our being, linked in Carol's description of the dog in the desert with feeding. I understand the Wild Things and, indeed, Max and his mom--and all of us--as building characters and personalities on those baseline elements of our humanity: orality and animal biology. I will not pretend to have interrelated all the things about this puzzling movie that puzzle me. What about the names, Carol, KW, Alexander, and the rest? What is the rationale for them? Are they to personalize these types? What about sticks and stones? What about dirt clods and snowballs? Furthermore, you can read the movie in quite other ways. For example, you can read it politically. We are, after all, dealing with a king, and a family is, traditionally, a miniature state. The Wild Things want a leader, a role apparently taken by Carol in the past. He now is alone, destroying "nests," without the others' help. He is angry because they are all separating, especially KW, the mother-figure. Then all the Wild Things anoint Max their king, because he claims extraordinary powers from ancient times. He is to be a benevolent despot who will get everyone to live together in peace and harmony, the big pile. "He's going to make us happy," says Ira. The new king's first order of business is a wild rumpus, animal howling, running, tumbling—some kind of celebration for the coronation. Then Carol leads Max around his realm and shows him an ideal city (Carol as Plato?). Max responds by his own project, the fort. The group comes together, cooperating under Max's leadership, in the common defense. Enter Bob and Terry, however, who have Jonze's voice, speak an exotic language, and get invited into the "fort." Immediately the group splits into pro-immigrant and anti-immigrant camps. Carol gets increasingly angry. The king begins to have "favorites." Then Max wants his own kingly space in the fort, and that enrages Carol even more. He wants everyone equal. "We gotta tear the fort down," says the idealist. Max responds with "what sometimes makes me feel better. Have a war." This degenerates from dirt-clod play into real hurts (Douglas' arm). Finally, the Wild Things realize there is nothing special about Max. "You're a terrible king." Carol says, "I can't trust what you say" and tries to assassinate him. Max abdicates his special status. "I'm Max," he admits, and Carol says, "That's not very much, is it?" Max leaves, like many another deposed monarch, with king and deposers alike howling with regretful grief. A political movie? Let's not forget that Jonze made this movie was made in the context of the Bush autocratic presidency and the pointless war in Iraq. Jonze, a progressive, might well use Max's fantasies to comment on fantastic claims of authority, infallibility, and promises of universal well-being. I don't suggest this political reading as contrary to the readings in terms of Max's family or his personality. It's at most complementary. The possibility of such a reading, though, suggests how very rich this film is. One can read the Wild Things yet another way, as embodying in their separate selves the attributes a film director has to have. You have to have an idea, an ideal plan, like Carol. You have to be technically capable like Douglas (and be able to think abstractly like Bob and Terry). You have to nurture your team, like KW. You have to be genial and supportive like Ira. You will probably suffer depression like Judith. And you will need to have your hand held like Alexander. Finally, you will sometimes just want to be alone, like The Bull. In short, Spike Jonze has transformed Sendak's magical tale into something quite different, much closer to Jonze's own sensibility. He has made the story into an exploration of someone's mind, Max's surely, yours and mine probably, and perhaps, ultimately, his own. Enjoying: When all is said and done, though, no matter what heavy intellectual artillery we bring to bear, this is an emotional, intensely human film. It is, after all, the story of how difficult it is to be a child or to be a human being, a story of separation, and a story of mother love. Relax. Just let yourself be moved.